Most children go through a period of picky eating once they start to become more mobile. This stage of selective eating is thought to have evolved as a mechanism to keep children safe as they explore their surroundings and gain more distance from caretakers who previously handpicked all food. Many children naturally outgrow this stage and expand their diet after 5, but we all know picky adults, and parents of special needs children often report nutritional deficiencies and sometimes even starvation in their children. As a former scientist and a mom of twins, one with autism and one without, I researched ways to help both my boys expand their diets and enjoy healthy foods. Here’s what I’ve learned. Picky or Selective Eating Disorder? With my twins, I’ve experienced both sides. 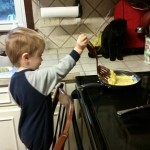 Even before he was a year old, my autistic son ate fewer foods than his non-autistic twin. He tested low on his iron levels and we supplemented him as well as sought the advice of a nutritionist who specialized in pediatrics. After he was diagnosed with autism at 17 months, we had help from our occupational therapist and behavior therapists to expand his diet, which had the side effect of helping both boys! How to Expand Diet for Both. Use the division of responsibility. Parents decide what, when, and where. Children decide how much and whether. Satter suggests serving 3 meals with sit down snacks offered at set times per day where the child comes to the table hungry, but not starving. One trick I learned from the boys’ preschool was to let them serve themselves as much as possible. Offer foods repeatedly. It often takes multiple exposures before a child is willing to try something new, sometimes 10 to 15 times. Seeing other people enjoy the food will make them more likely to try it themselves. My autistic son refused to even touch french toast until he saw how much his classmates were enjoying it. If you know an older child who eats a wide variety of options, encourage them to eat healthy foods in front of your children. Children are more likely to eat what they see other children eating compared to adults. Offer a selection mixing new foods with familiar favorites. I’m not a short order cook, but I do try to have at least one good option that I know each boy will eat each meal, especially when I’m trying out a new dish. Satter suggests setting out 4-5 foods on the table per meal, including protein, a couple of starchy foods, fruit or vegetable or both, and milk (we do yogurt or cheese instead). Since my boys are fairly good about eating their vegetables, I only set out one starch unless I’m introducing the boys to a new vegetable. Include them in the preparation. 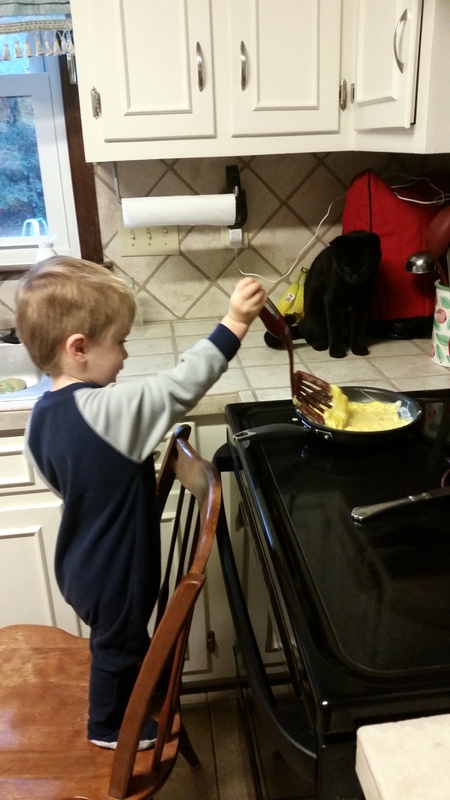 I’ve been having my boys ‘help’ me cook since they were toddlers. A lot of time it causes extra mess, but seeing how the food is prepared makes them more likely to try it. Recently, I was preparing roasted broccoli for the first time and one of my twins kept snagging the bits of the raw broccoli to eat while I was putting on the tray. At first, I was annoyed that he kept getting in my way and stealing what I was trying to prepare to roast as part of a salad. Immediately after, I realized how stupid it was to be annoyed by a 3 year old stealing broccoli, so I set aside a section for him to snack on. Tasting the broccoli before roasting made him more likely to eat after. Build on what they’ll eat. I once tried making grilled cheeses for my boys and they wouldn’t touch them even though they liked the cheese and toast separately. My son’s therapist had me make some toast and, with my son’s help, sprinkle a tiny bit of cheese on top of it. We called it cheese toast and both boys gobbled it up. Over time, we slowly added more cheese and eventually tuna until we could make open-faced tuna melts. Take advantage of their obsessions. My mom raised 9 kids and only made two types of sandwiches for lunch – peanut butter and jelly or tuna fish and pickles. However, since we were obsessed with dinosaurs, she cut up the sandwiches into different “dinosaur teeth” shapes. She only cut the sandwich up a few ways but, as children, it seemed that we had a wealth of options. When my boys were obsessed with vehicles, I planned food around vehicle themes. Now that my boys are obsessed with Star Wars, I’ve gotten them to eat things they wouldn’t touch before by using Star Wars cookie cutters, giving Star Wars themed names to the dishes/foods, and using things like Star Wars themed soup to introduce them to dishes that they wouldn’t eat before. Let them play with their food. Play is a great way for children to learn about the world around them and when you observe adults trying out a new food for the first time, they’ll often engage with it the way that children do. They’ll poke at it, sniff it, and take the first taste with a lick or tiny bite. There’s a difference between playing and making a mess, but if you have a very picky eater, it can help a lot to ease up on your standards for table manners at home. The first few times my autistic son tried shelled edamame, all he did was pop the beans out of the pod, mangling many of them in the process. I let him play and salvaged as many for my own meal as I could. The third time I set them on the table, he happily popped them into his mouth to eat and, once he was eating them regularly, I tightened up the table manners again. For my son, the tips mentioned above helped, but didn’t cure his Selective Eating Disorder. Instead, it was vitally important that we discover the root cause of his selectivity and address it head on. 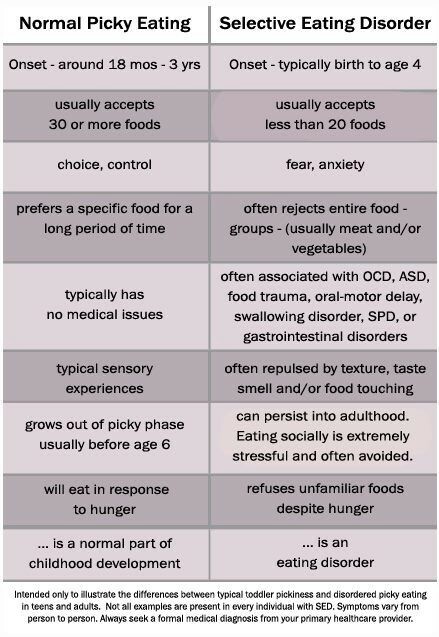 In Violet’s case, the eating instinct was destroyed almost as soon as it emerged, by what’s known medically as an ‘‘oral aversion.’’ Also referred to as ‘‘oral defensiveness,’’ and more unnervingly as ‘‘infantile anorexia,’’ this condition results when a child refuses to eat as a way of protecting herself from perceived trauma. Other children have oral-motor difficulties that cause them trouble eating certain foods, which can lead to gagging or other experiences that frighten them or make them reject types of food. My autistic son had never experienced medical trauma, no oral-motor difficulties, and we’d been following Satter since the beginning, so he hadn’t experienced parental pressure. Instead, like many autistic children, he had difficulties with texture due to sensory sensitivities. He didn’t want to touch substances that were wet, mushy, or slimy, much less put them in his mouth. Even things that child ordinarily love to eat – brownies, cupcakes, cakes, etc – were left untouched, or if he touched one with his finger, the offending foods were quickly wiped away instead of sampled. He hated getting his clothes wet, so he also avoided food that could easily drip unless I let him eat naked and, even then, it had to be food that was unlikely to drip if held a certain way, such as popsicles that had a cloth around the bottom. Decide how to treat the selectivity. As described in When Your Baby Won’t Eat, there are two main approaches to feeding therapy. The most common one is behavior modification using one-to-one reinforcement. Parents often try this method at home by bribing or rewarding their children for sampling or eating food. Yet, it can sometimes have disastrous results, as we discovered with my son. Although it went against what I had learned through Satter and my own instincts, I decided to try out the behavior method recommended by one of our therapists who had seen it work with another client. We promised a reward for my son if he took a bite of his macaroni and cheese – a dish he had once tried, but stopped after that brand disappeared from stores. He took the bite – then immediately started gagging. To their credit, the therapists agreed with me that it had been a mistake. He didn’t eat macaroni and cheese for nearly a full year later when I tried again with Star Wars themed noodles. Instead, the behavior therapists worked with our occupational therapist to help me structure a model based around what Satter suggested using a child-led approach. Lay off trying anything for a few weeks to help the child feel ‘safe’ again. Let them explore the food. Treat the food as a toy and explore different ways of experiencing the food. After your child is used to playing with the food without issue, start setting it on the table. Add very, very small amounts of new food into items your child is already eating. This is similar to the grilled cheese story above, albeit moving at a much slower pace. We ended up following a much simpler version of that text without using stickers, in part because my son never needed them. If he wanted to play with the food, he was welcome to do so and we set up situations where we encouraged playing, but never rewarded externally for playing as we wanted the fun to be its own reward. Mostly we had great success playing with unusual textures such as play dough, silly putty, slimes, etc. I love to make these at home from various edible recipes. You can make all sorts of sensory items from food substances, even slimes. My son will eat some things without touching them – frosting for example – but they have to be really, really enticing. For the most part, if he won’t play with it, he won’t eat it. Getting him to play with it has been the key to getting him to eat it. What’s worked (or failed) for you?